The last thing you probably want to do in the summer — no matter just how hot and humid it may be — is sit inside. But when you're living in an urban setting or a big city, finding adequate space to enjoy the outdoors in privacy can prove to be rather difficult. It's no surprise that potential homeowners looking to buy in the summer months prioritize adequate outdoor space — and for some willing to shell out the big bucks, the outdoor spaces can be even more extravagant and breathtaking than the indoor space itself. Boasting over 2,000 square feet of private outdoor space, the penthouse at Anbau’s latest luxury condo includes open-air features such as a roof deck with a built-in stainless steel gas grill, smoked gray granite countertops, ample seating and stunning 360-degree city views. Perfect for al fresco entertaining in New York’s warmer months, the five-bedroom, four-bathroom home is situated in the heart of Manhattan’s storied Upper West Side. Pricing available upon request. Located in the elite enclave of Bal Harbour, this penthouse features multiple outdoor spaces totaling over 9,950 square feet, including a roof deck; terrace with an elevated heated 32-foot infinity pool, Jacuzzi, outdoor kitchen and dining area; and a sunset deck with breathtaking views of the Atlantic Ocean, Biscayne Bay, the Bal Harbour marina and Miami’s intoxicating city skyline. Ideal for outdoor living from dawn to dusk, the 4 bedroom, 6.5 bedroom unit ranges from $25 to $30 million. The spectacular $25 million, five-floor traditional townhome at The Residences at Prince has one of the most serene private oasis’ in Manhattan. This 7-bedroom, 7.5-bathroom home is located in the heart of Downtown Manhattan’s Nolita district, and when the homeowner exits their family dining and parlor area through the elaborate Schuco French folding doors, they are met with a 1,115-square-foot bi-level backyard space. Designed by landscape architect PFI, the backyard is accented with a variety of unique trees, shrubs and vines and perfect for any urbanite looking for peace of mind. The sprawling outdoor terrace and landscaped garden accessed by floor-to-ceiling glass doors at this four-bedroom, four-and-a-half-bathroom duplex is ideal for green thumbs wanting a private space to call their own. Residents of the maisonette, ideally positioned on Manhattan’s charming Upper East Side, experience the rare combination of a secluded first-floor backyard space complete with outdoor kitchen and access to the condo’s amenities, such as the 24-hour doorman and concierge service. 155 East 79th Street’s maisonette is listed for $9.55 million. This expansive private terrace with jaw-dropping views of New York City gives new meaning to residents’ morning coffee or sunset cocktail. Measuring 10'6" x 39' and part of a $1.9M home, this oasis offers owners a respite from the bustling city without ever having to sacrifice the Big Apple’s enchanting views. The two-bedroom, two-bathroom residence, is part of K. Hovnanian® Homes' Nine on the Hudson, which will set the standard for luxury living along New Jersey’s Gold Coast. The ultra-lux $40 million penthouse at this expansive seven-and-a-half acre property nestled In Miami Beach features elevated privacy and nearly 13,000 square-feet of outdoor living space. 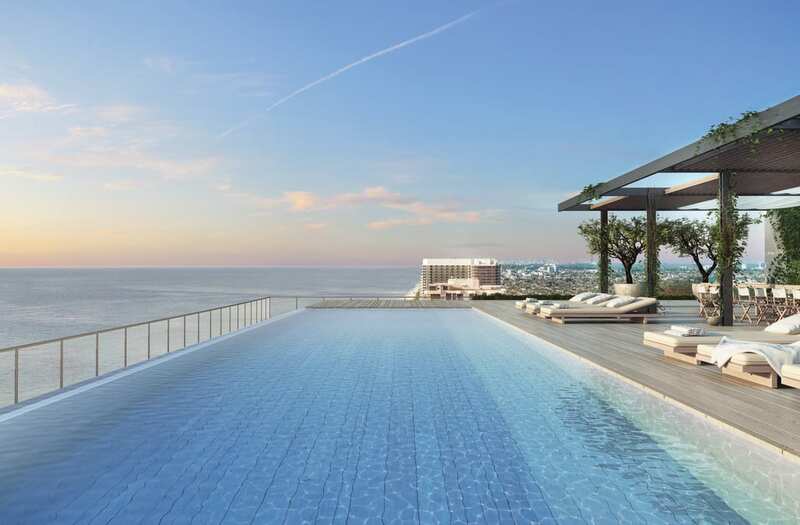 Upon completion, the lavish eight-bedroom, 10-bathroom residence will boast two separate sunrise and sunset swimming pools each complete with hot tubs, additional plunge pools off the master suits and an expansive alfresco kitchen and bar with undisturbed western views of Biscayne Bay and the downtown Miami’s skyline. The ultra-lux, 19-unit boutique property situated in the heart of South Beach is a breath of fresh air for residents who prefer to pass the time outdoors amongst the lush and tranquil landscape. The loft-style residences feature private outdoor gardens with over 1,500 sq. feet of open-air dining complete with a full alfresco kitchen and seating. Residences range in price from $1.7 to over $9 million. From the unassuming streets of SoHo in Manhattan to beachside dreamscapes in Miami, these apartments are serving serious views and room for play that might just make you never want to go back inside — until the snow comes, that is! So whether you're dreaming of all-day barbecues, nighttime cocktail parties or just good old fashioned sunbathing, there's no denying that you a private outdoor oasis is the one luxury that might just be worth splurging for.